On one of the busiest days on the Tideway, Oxford took on the Henley-based club, Leander. This fixture was short but sweet, racing from the start to Chiswick Steps. 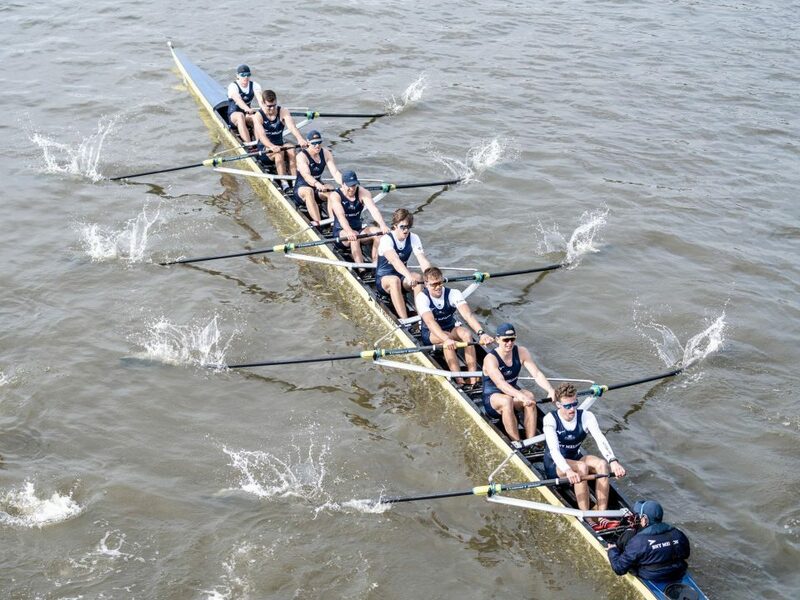 A number of alterations in the Oxford crews have seen seats shuffled and rowers and coxes reallocated to produce – what Oxford hope – to be their fastest combination. Leander won the coin toss and chose the Surrey station. Neither were able to create a sizeable lead within the first few minutes of the race, despite aggressive steering from Oxford, that resulted in a warning from the umpire, Rob Clegg, at the end of the boathouses. By the time the two crews reached Fulham Football ground both boats continued to fight for the stream, a tactic that resulted in the umpire once again warning the crews, this time Leander. Vocal encouragement followed for Oxford from their coaching team, which spurred them on to take a slight lead at the milepost. This lead was short-lived for Oxford, the Surrey station enabled Leander to come back by the Harrods Depository, meaning as the boats past the world famous building both crews were once again level. Only a few strokes later Leander were warned on two successive occasions by the umpire for encroaching on Oxford’s line as the pair approached Hammersmith bridge. Both coxes were eager to steal the faster line under the bridge, steering their crews to within inches of one another, not once, but twice. On both occasions the umpire deemed it to be the fault of Oxford, who were warned back onto their station. From here the battle continued as slightly rougher water near the two-mile mark began to make racing tougher. As the crews neared Chiswick Eyot, Leander capitalised for a second time upon their Surrey advantage and managed to secure a half-a-length lead over their opponents, but their chosen line would cost them dearly. Once parallel with the Eyot, Leander were warned back onto their station, allowing Oxford to exploit the faster water that flows on the Middlesex side of the Chiswick Reach, and after strong encouragement from the OUBC coaches, the Blue Boat managed to regain control. The conclusion of the fixture was positive for the Oxford Blue Boat, who won by a canvas over Leander Club. After a disappointing loss to their home rivals – Oxford Brookes – last weekend, this was a solid win over one of the best clubs in the world. The real test, however, will take place on the 7th of April. This weekend should give Oxford confidence as we charge towards the biggest day of the year for these young men.